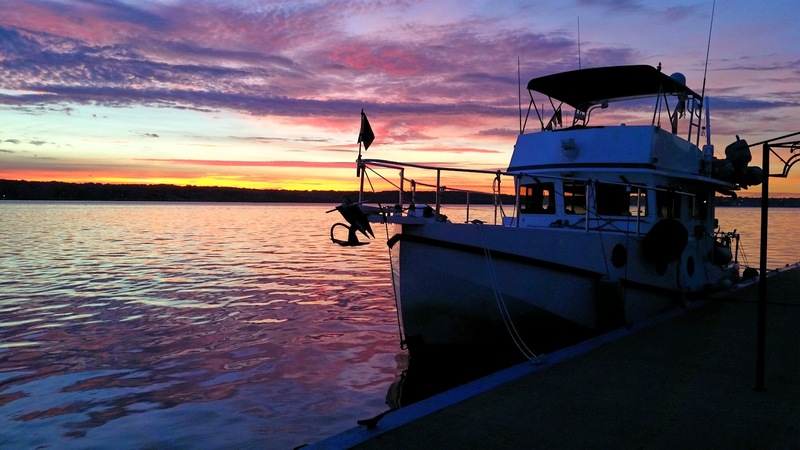 It was finally time to leave Port Charles Harbor, so Young America and Carolyn Ann headed out. The high water, carrying lots of debris, that we saw when we arrived had passed on by. As a matter of fact, we were concerned that the water might drop so much that we couldn't get out of the marina. But we made it out and found that we only had a knot or so of current against us. There are about 25 locks from this point up to the end of navigation on the Mississippi. We transited two on our first day. Got through the first one quickly and thought we might have a long wait for the second until one of the tows said we could go ahead of him. A great way to start the trip! Our first stop was Two Rivers Marina in Rockport, IL. Heavy rain the next morning kept us at the dock so Joe took advantage of the stop to change the oil - and found the transmission oil in one engine cloudy. Not a good thing, but at this point we're not sure how bad a thing it is. It will be watched. We had a leisurely morning the next day because fog kept us from an early start. Once we got going, though, we went through two locks without too much waiting and made it to Quincy, IL. The next day we got through one lock with no waiting and were heading for our second of the day. The lock master said he would send us up between two tows, so we were heading quickly to the lock - well, in our boats, quickly is a relative term. Fred and Linda saw a jet ski in distress just off the channel. A call to the Coast Guard revealed that they did not have a boat in the area. A line was thrown to the jet ski driver, but there was no way to attach it. The driver wrapped it around the handle bars, but when Young America started pulling, the jet ski toppled over and the line came loose. Now they were in the channel with a tow heading upstream toward them. A small boat came to help and asked the jet ski driver if she had fuel. Her reply was "apparently not." Next he asked if the fuel switch was on. As she started to reply "of course," she looked and it was not. The jet ski was righted, fuel switched on and she was off - saying she'd had a "blond" moment. The lock master was kind enough to wait - much to the chagrin of a tow waiting up above! - and we both were locked up. Shortly thereafter we decided to call it a day and stopped at Keokuk, IA - free wifi that worked! There are lots of safe places to anchor along the way - sheltered from the current and loose barges -behind the many islands. The whole way up, though, we only anchored once. We had a nice quiet night, although the anchors we reluctant to be pulled from the tenacious clay the next morning. After a few more days we stopped at Marquis Harbor in Moline, IL. Gene, Linda's brother who lives nearby came for lunch. We enjoyed meeting him and hearing some of the family stories. Linda was disappointed that her mail, being sent to the restaurant next to the marina office had not yet arrived. The next morning brought an impressive thunderstorm. We had planned to wait for the mail anyway, but the storm delayed Gene who had offered to take us to a grocery store. Once the storm passed, Linda and I decided to walk the 2+ miles to the store. Along the way Gene called and said he was at the boat to take us shopping. Once we figured out where we were, he picked us up and off we went. That was the really good news because it was hot - and the store may have been way more than 2 miles after all. Linda's mail didn't come, again. Our stop that night was in Sabula, IA. Linda and Fred had stopped here last year and were told they had to go to Bombfire Pizza. Linda called the restaurant and Tom, the owner, offered to pick us up at the marina. Tom is definitely a quirky kind of a guy (a hippy still living in the 60's), as is his restaurant. He says he never had much luck making money when he tried to, but as soon as he quit trying he'd done much better. The seating area was small - although there was additional seating in the basement with its wet concrete floor - the pizza's are wood fired and unusual - we had Thai chicken pizza which was yummy. There was even entertainment! A piano player/singer, who allowed some young boys to join her, gave way to a young autistic man during her break. He played quite well on the out of tune piano and had never had any musical training. All in all Bombfire was a different experience. We had an easy day to get to Dubuque's Ice Harbor. They've put millions into the waterfront and built a very nice marina - which sits practically empty. They are not allowed to lease any slips, so only allow transients. I decided to take advantage of the laundry there and when the girls in the office found out I was craving a frappuccino, they decided they wanted some also and gave me a ride. Real nice staff there; we plan a longer stay on the way back down river. In our attempt to move north quickly we had long days and lots of locks. It's all a blur. We got so when someone asked where we'd stopped the night before, none of us could remember. The landscape changed along the way. High bluffs appeared along one or both sides of the river. According to what I've read, this is the "driftless" region. The glaciers did not cover this area and wear down the hills, but the runoff from their melting and the rains helped the river cut through the layers of sandstone and limestone, forming the bluffs. Everybody knows that the Mississippi is often referred to as muddy. And that seems to be true. But it doesn't carry all of the mud down to New Orleans. It drops it all along the way. There is constant dredging going on to remove the sand from the channels to keep them deep enough. This is one of the large dredges that we saw. So, what happens to all the sand they dredge up? Some of it becomes big sand dunes along the river - which become beaches for the local boaters. Sometimes the dunes are kind of horseshoe shaped and make a nice little protected harbor for small boats. 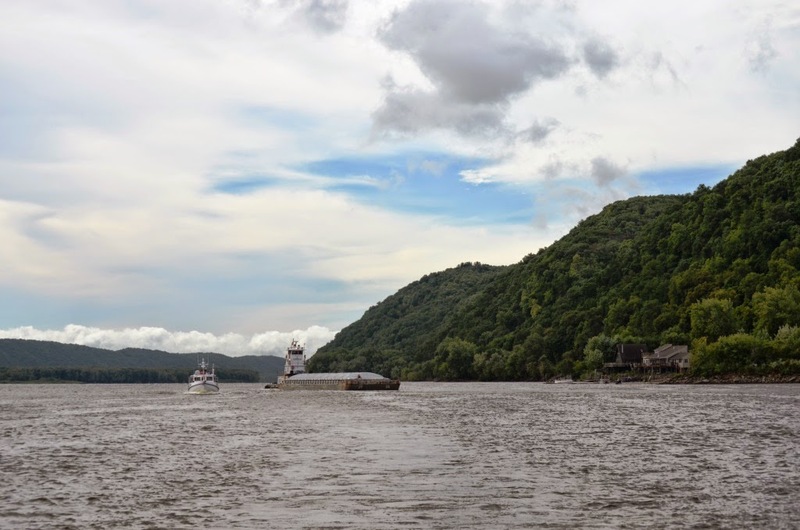 Generally, the railroads run up both sides of the river, like on the Hudson, and small towns - often only one street wide - have grown up between the railroad/river and the high hills. We made a brief stop at one - Alma, WI. The guide book mentioned the courtesy dock - which really was a pretty good dock with room for both boats. The book will often stipulate that you can only stay at the dock for a limited time. For Alma's dock it said: " ...dock provides transients unlimited time to visit Alma-Portable restrooms." Of course you had to walk across two heavily traveled train tracks to get to the porta-potty. But it was a good place to stop while we waited for our turn in the lock. When the tow exited the lock with his large barge array we decided it would not be a good place to spend too much time. A little too close for comfort! The trains also blew their whistles all the way through town. I guess the locals get so they don't hear them - or maybe just go deaf and don't hear anything. Another interesting thing about Alma: they do have more than one street paralleling the river, but often the "road" connecting the two is only a long flight of stairs! As we neared St. Paul, we were greeted by Liz and Steve - waving and snapping photos from their dock. We'd met them five years ago as we were nearing the end of our first loop and they were just starting their's. Later that evening, they picked us up at our marina and we all went to dinner. Liz and Steve had managed to squeeze us into a busy schedule - they'd packed up the house and rented it out and were leaving in a few days to cruise on their boat full time. Between all their chores and going away parties, we were lucky to get them for an evening. So much fun to see them again! Enterprise came with a car the next day and Joe and I went into tourist mode. 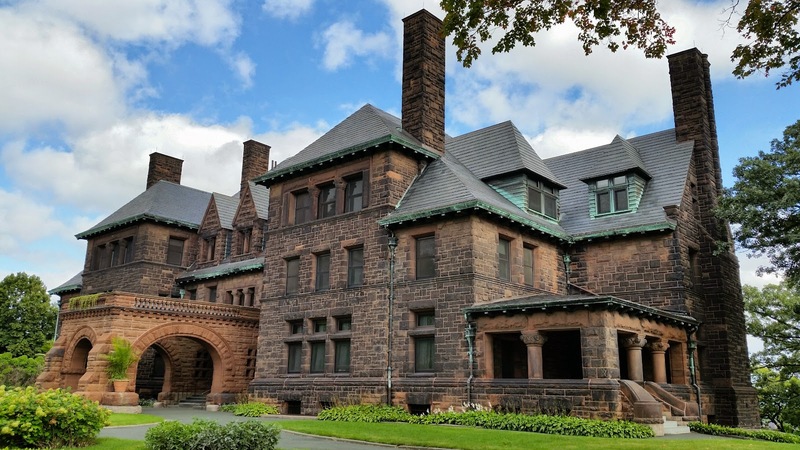 Our first tour was the James J. Hill mansion. 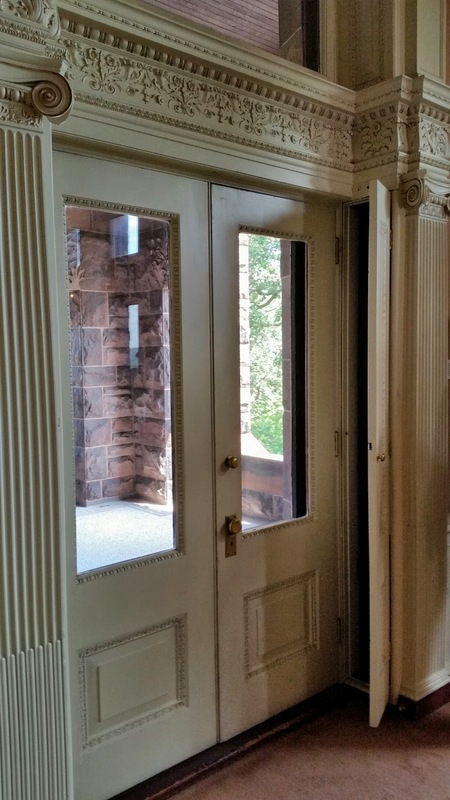 I'm always concerned when I take Joe on house tours, but this one turned out to be great! The house was completed in 1891 with all the latest inventions - electricity (with back-up gas fixtures) and thirteen bathrooms. The Hills moved there with eight of their children and had a staff of ten to twelve - so they needed a large home. About 36,000 sq.ft. The amount of ornately carved wood was just incredible, but there were some other things that really caught our attention. Being one of the richest men in town, Hill was concerned about security. Wrought iron bars covered many of the windows at night. During the day, the bars slid - like a pocket door - into the window casing. Then there was a decorative wooden door that closed over the slot so it just looked like a window with a nice carved casing around it. We got to see rooms on four floors, including the basement laundry. With at least 20 people living in the house, laundry must has been a full time job. Considering where they lived, it could not be hung outside to dry all the time. 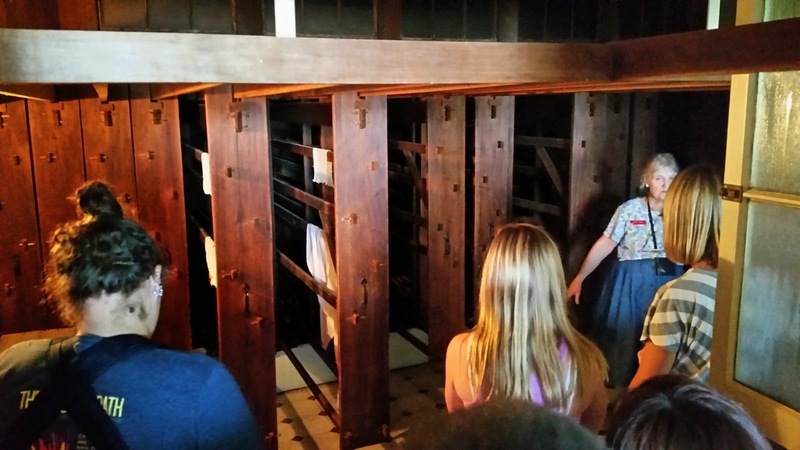 Adjacent to the room with big laundry sinks was a drying room with big pull out cabinets that had rods in them. When we left the house we were right across the street from the St. Paul Cathedral, so we took a look inside. No weekend or holiday tours there, but Joe decided to attend Saturday evening mass. Since mass wasn't until seven, we decided to find a place for an early dinner. The first place we found - with a free parking space right in front - was Moscow on the Hill. We'd not eaten at a Russian restaurant before, Yelpers seemed to like it, so we gave it a try. We had Svekolnick (a cold beet soup) that was fantastic and a plate of pelmeni (dumplings) served with sour cream and vinegar that were great. We weren't so impressed with the borscht and cabbage rolls, but they were okay. 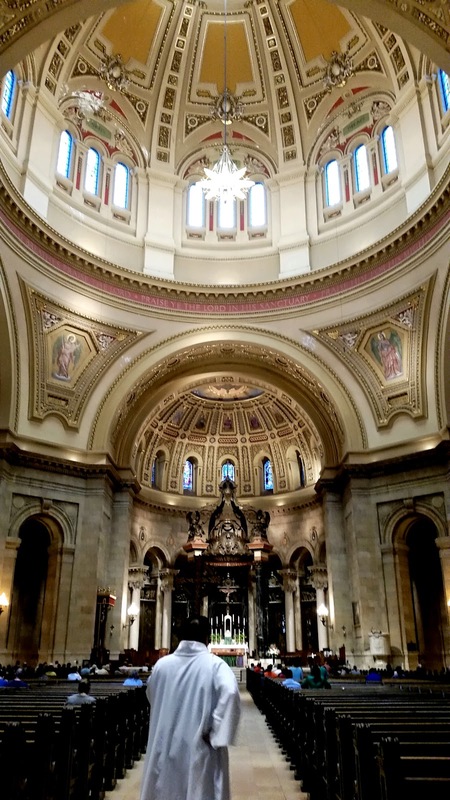 The next day, since Joe had gone to mass on Saturday, we arrived at the St. Mary Basilica in Minneapolis just after mass for a tour. The tour started with a fairly large group - and the organist still playing. After about five or ten minutes, of what was supposed to be a 15 minute tour, the organist had quit and most of our group had departed. They were in town for a wedding and had a tight schedule. That left a mother and daughter and Joe and me along with our docent, Jim. Jim, a seventh grade history teacher, gave us a great tour - way more than 15 minutes - and then Joe and I joined him for coffee and had a nice visit. That blew our schedule for the day, but it was well worth it. 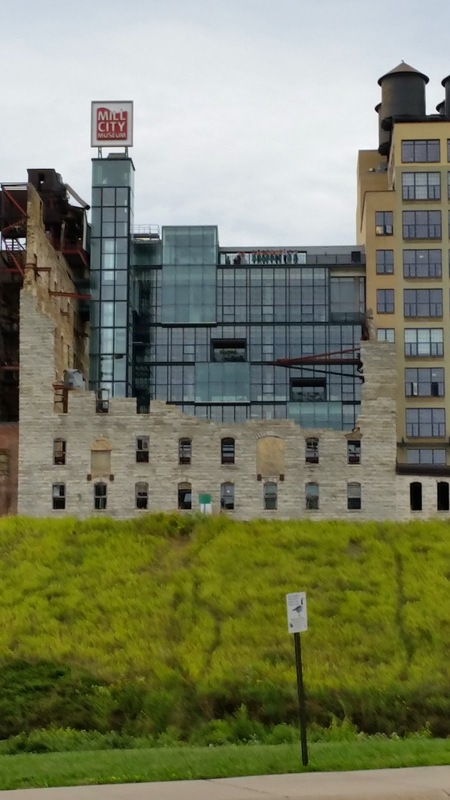 We visited the Mill City Museum next. Minneapolis produced a large percentage of our country's flour, using the St. Anthony Falls on the Mississippi for power. The museum is built in the ruins of an old mill and has a unique presentation called the Flour Tower. You sit in a large freight elevator equipped with seats and it goes from floor to floor showing different aspects of the mill operations. The elevator ride ends on the top floor where you can walk out and see the river below - the falls and the last lock on the river. The falls are not impressive and would have completely disappeared had they not been reinforced with concrete. On Monday, Labor Day, we visited the sculpture garden in Minneapolis. The Spoonbridge and Cherry is supposed to be the iconic Minnesota sculpture. Besides the sculptures there was an artist designed miniature golf course. It was free to play - after a 2-1/2 hour wait. We passed, but it was interesting to see. Next we thought we'd drive around a bit and stop by Minnehaha Falls. (You should hear how my navigation pronounced Minnehaha - lots of big hahas from us!) We got to the park and it was mobbed - a beautiful Labor Day - so we gave up on that. Tuesday before we turned in the car, we took a tour of the state capitol building in St. Paul. Of interest to us was that it was the same architect that designed the capitol building in Charlston, WV, which we had visited on our trip up the Ohio River. Before we turned in the car, we made the obligatory trip to Costco and Sams, although we didn't really need anything. 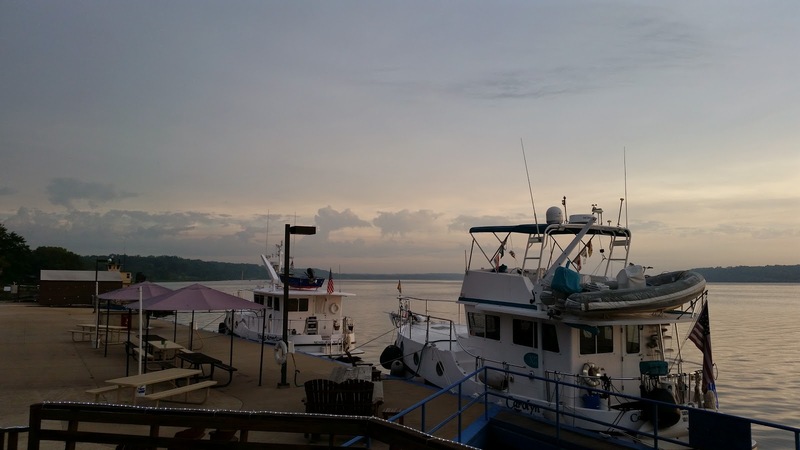 Thunderstorms Wednesday morning kept us at the marina. We ended up staying all day and doing pretty much nothing. Gotta have those slug days occasionally. Thursday we were back on the water - heading north. First we had a 38 foot lift at lock number 1. About six miles later the Lower St. Anthony Falls lock took us up 25 feet. Less than half a mile farther on was the Upper St. Anthony Falls lock and its 50 foot lift. This is the last year that the Upper lock will be open so we were glad we decided to come this year. The end of the navigable river is about four miles beyond the lock. We turned around at the DANGER sign. Since we'd heard about the lock closing, we were surprised at the amount of industry above the lock. Sand and gravel off loading, scrap metal processing, etc. It seems that lots of jobs will be lost with the lock closure. We were told that one of the reasons for the closure is to drive those places out of business because they aren't attractive along the river. I bet the people that work there think they're pretty attractive. So, on that note, we started back the way we came. We moved along pretty quickly for several days. Actually it was quickly compared to our usual speed of 8 mph. I think we got up to about 13 mph! Some days that was counteracted by long waits at locks, but that's the way it goes. Dubuque was our next tourist destination. We arrived back at the marina which was again practically empty. 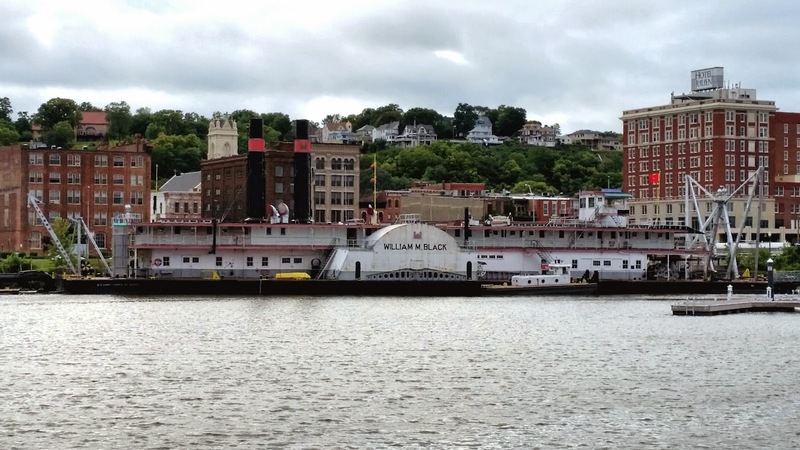 Right at the harbor is the Mississippi River Museum and Aquarium. We went there on our first day - saw a short 4D movie, several really good films and displays - and didn't even make it to the second building. Evidently we are not the only ones who couldn't do it all in one day - our ticket was good for two days. We spent the whole second day also, getting through the second building and the William M. Black - the last steam powered paddlewheel dredge. The next day Enterprise picked us up and we were off to Spring Green, WI and Taliesin, Frank Lloyd Wright's home and architectural school. 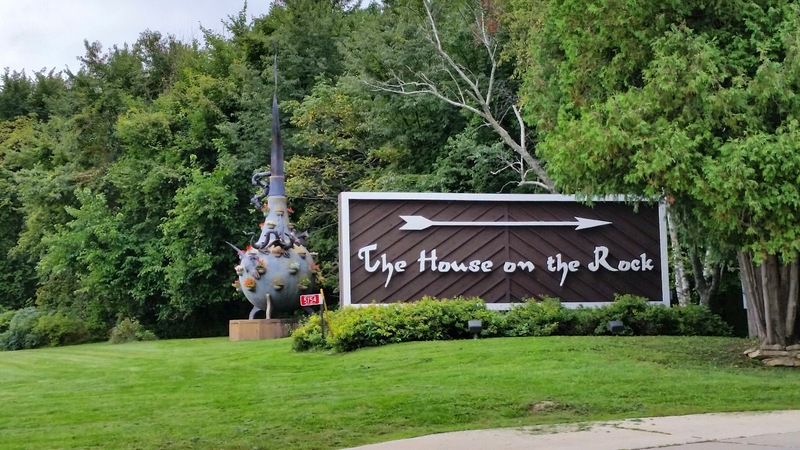 But first we stopped at the House on the Rock. As a young man Alex Jordan liked to picnic on a rock in a field. He decided he wanted to have it to himself and leased the rock from the farmer who owned the land around it. Eventually, his parents bought the whole farm. Mr. Jordan started building a room on the rock and just kept adding more rooms. People were curious about what he was doing and were willing to pay to see it. So he started charging and used the money for more building and eventually amassed some odd collections. It's dark, it's odd, and unfortunately the mechanical chamber orchestra is not working. One of the more famous parts is the Infinity Room which juts out over the valley. Joe walked out there; I did not, especially since I'd read that it sways in the wind. After dinner in Spring Green in what was an old bank - we unfortunately did not get the table in the vault - we went to a hotel for the night. The next morning was our four hour estate tour at Taliesin. For this tour, you are dropped off at one end of the estate - the architectural school - and walk about a mile and a half across the estate to Taliesin, Frank Lloyd Wright's home. And it was raining. In spite of that it was a great tour. There are many small buildings that were originally sheds and larger ones that were barns that are now living quarters. Current and former students and staff live on the property. We saw one man in his 90's, who is a former student, walking his dog outside Taliesin. No interior pictures, of course, but the house was filled with the Wright touches that we've come to expect. 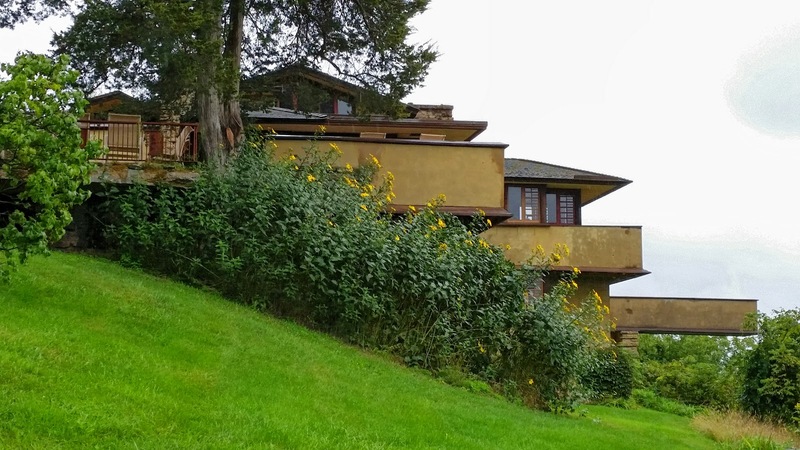 The house itself flows down the hill, illustrating Wright's style of designing for the site. 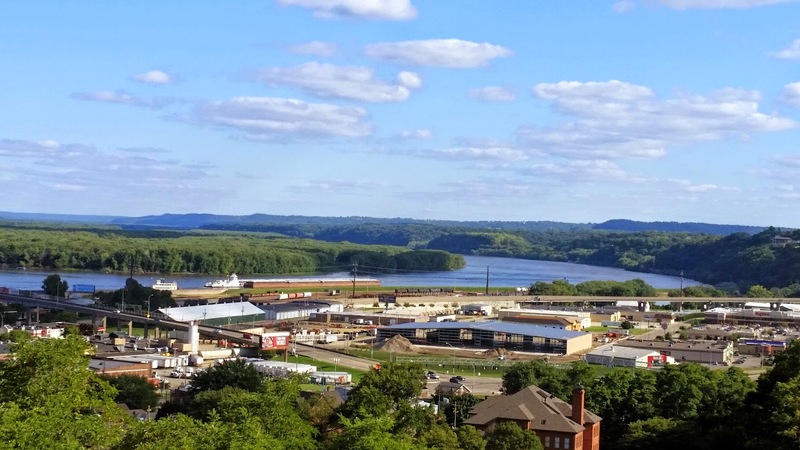 We took a scenic route back to Dubuque that sometimes went along the Wisconsin River, but more often roamed through beautiful farmland. The way they plant the fields, leaving wide waterways, is a work of art. I can't count the number of times we had to stop for photos. 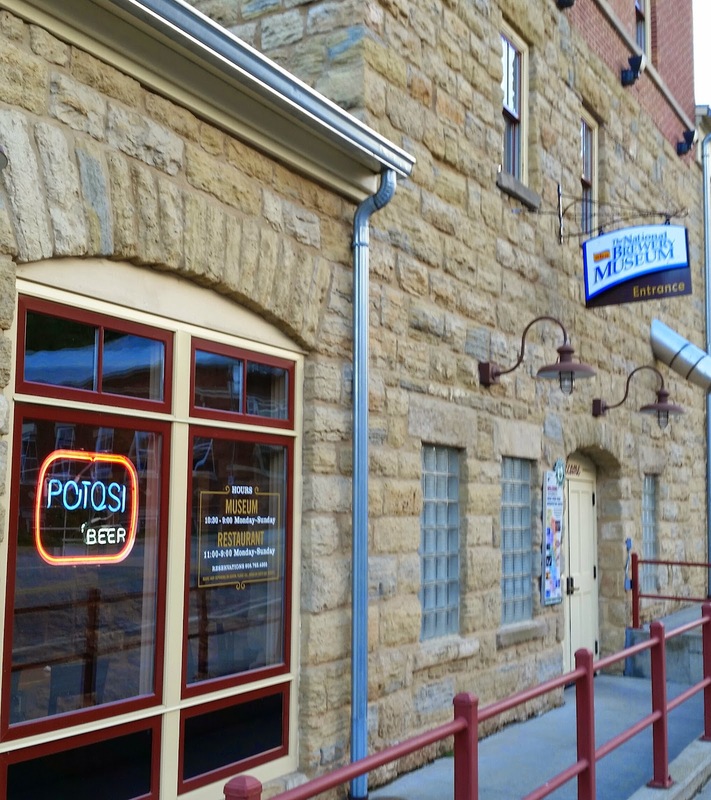 Potosi was on our route home. It is home to an old brewery that was built over a small spring fed stream. It eventually closed, but was selected by the Brewer's Association to be home to the National Brewery Museum and a micro-brewery. 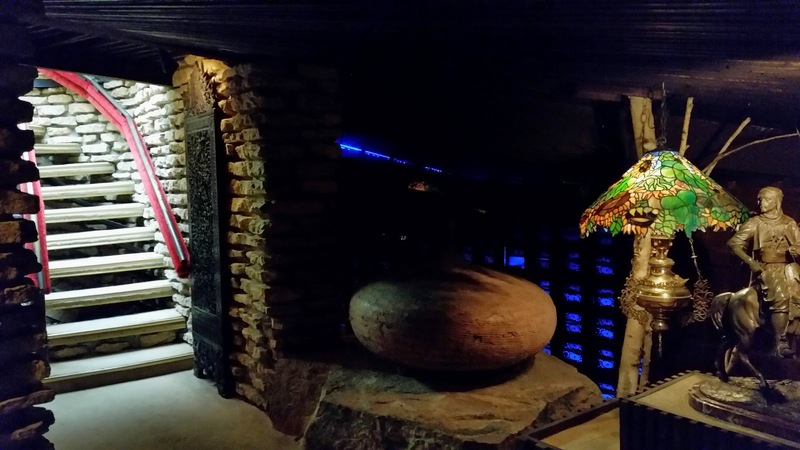 We were allowed to see the cave where the beer was stored before the advent of refrigeration and some of the exhibits without cost. To see all the floors of exhibits there was a $3 charge - that also entitled you to an $8 beer! So we paid our $3, saw lots of old beer cans and bottles and some cute films - one on hops and one on "beer clean" glasses. Then we went into the bar area to see the spring flowing beneath the floor and have our beers. Joe had a Snake Hollow that he said was the best IPA he'd ever had. We even saw growing hops as we left. 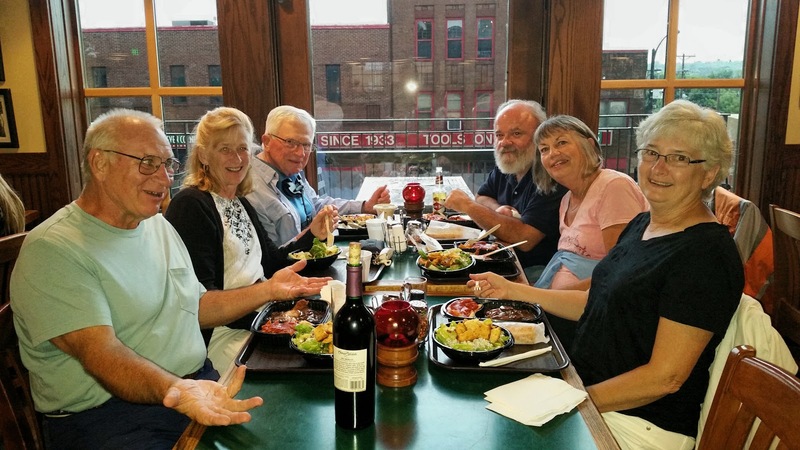 When we were in Port Charles, before starting up the Mississippi, we met Mark and Becky who live in Iowa and were getting ready to start cruising. Mark seemed to have friends in every town we could stop in and we ended up meeting a couple of them in Dubuque. John and his wife Pam came to our marina just as we were leaving to ride the Fenelon Place elevator. They ended up taking us and riding along. This is similar to the inclines in Pittsburgh but claims to be the shortest, steepest incline in the world. It was originally built by a banker who lived up the hill and worked at the bottom. At lunch time it took him a half hour each way to go home for lunch. After eating it didn't leave him time for a nap, so he built the incline to shorten his commute. Friends started asking for rides, so it was eventually turned into a business. John and Pam are looking for a boat to do the loop in, so after a tour of Carolyn Ann we went to dinner and talked boats and cruising in general. They're a great couple and we hope to cross wakes in the future. Joe's gotten into the habit of marking the water level on a piling when we stay at a marina for more than one night. While in Dubuque we'd seen the water rising and knew we'd need to leave before it got high enough for them to close their flood gate. It wasn't even close to that level when we left, but when we got to the first lock downstream we could see the dam gates were open and the water level seemed to be the same above and below the dam. We still had to use the lock - for a six inch drop. When we got to the next lock we were told we'd have to wait for one to two hours for a double. That's what they call it when the tow is pushing too many barges to fit in the lock at once. 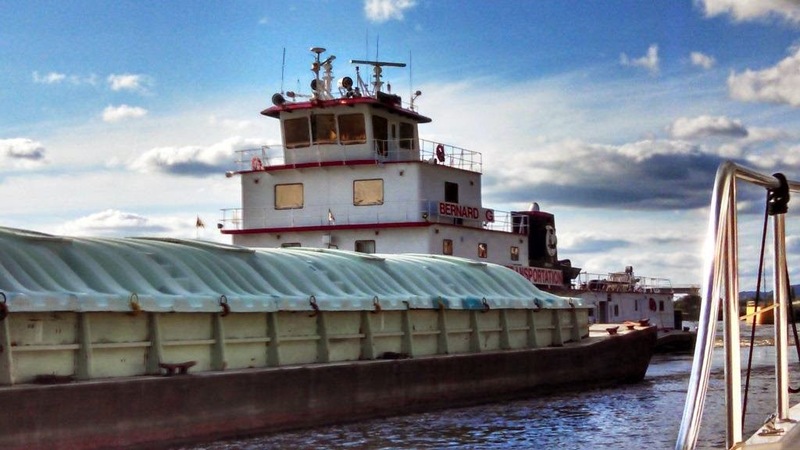 They push the first nine barges into the lock and disconnect them from the rest. The barges are locked down and flushed - using the lock fill valves - out of the lock. They're secured on the wall outside the lock; the lock is filled again; the tow pushes in the rest of the load and locks down. 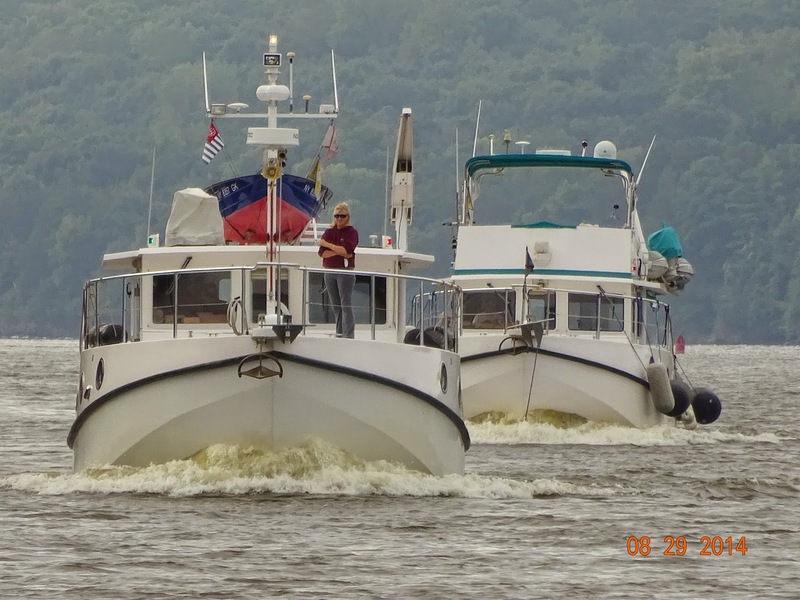 Then the tow pushes out, reconnects the first bunch of barges and is on his way. So we'd have to wait. Sometimes we can tie up somewhere while we wait, but the current was strong and the wind was blowing so much that we didn't think that would be possible. So Joe worked at keeping Carolyn Ann under control and out of the way. Just as we were about to be let into the lock an excursion boat called the lock and said he was about 20 minutes away. We could lock down with him, but we had to wait for him to go in first. So, about 20 minutes later we could finally see him coming. Eventually we both were in and secured. Then the lock tender came and handed Joe a box of brownies that he said were from the excursion boat captain to thank us for waiting. So we felt a little better about it - until Joe called the captain to thank him for the brownies and found out that he had actually given them to the lock staff! Our next tourist stop was Moline. After Enterprise picked us up, we picked up Joe's Uncle Phil who lives nearby. We then drove to Abingdon, IL to visit Joe's Aunt Kay, still in the nursing home. Three of Joe's cousins met us there also and we all went to a local restaurant for lunch. After lunch we made the short drive to St. Augustine to see the family farm, the old church (1836) and the cemetery where relatives from both sides of Joe's family are buried. 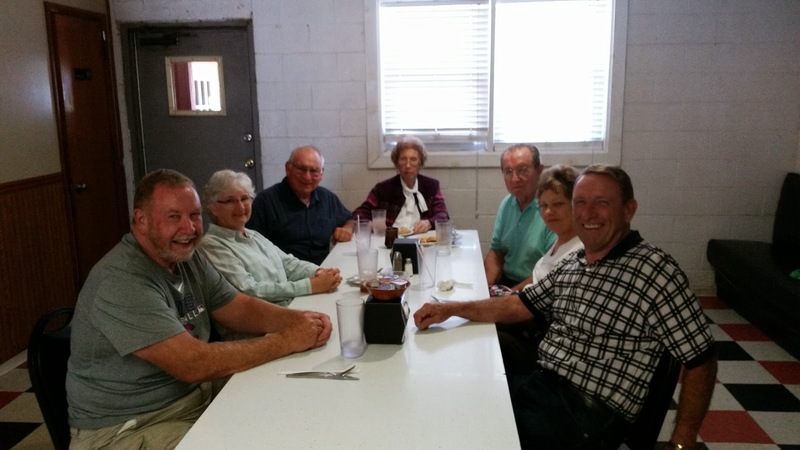 Then it was back to Rock Island for dinner at Uncle Phil's with his wife, two of his daughters, one of their husbands and some of the grandkids - including one of the biggest 3 year olds we're ever seen! Continuing in tourist mode, we visited the John Deere Pavillion. Have to say it was better than Caterpillar's. Free, for one thing, plus we had a tour with a docent who was very good. The company history was interesting and we learned one surprising thing. We asked why some of their equipment was yellow instead of green. There is an international agreement that all construction heavy equipment will be yellow. 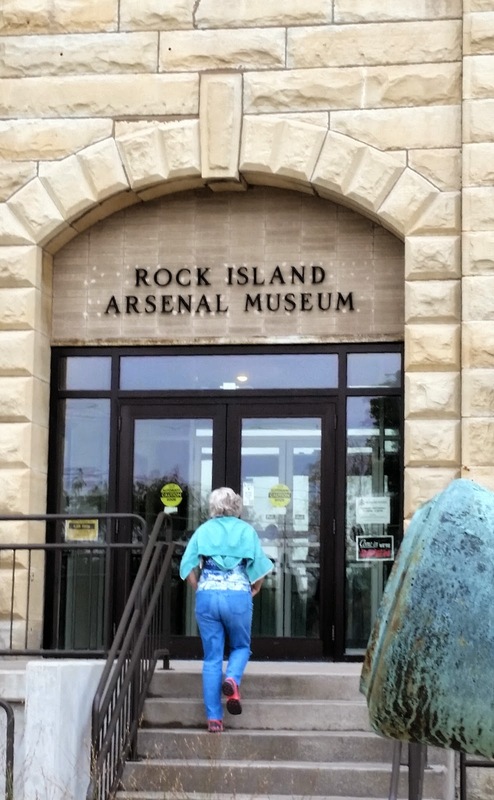 The next day we went to the Rock Island Arsenal Museum. The arsenal was created to construct and repair weapons and also served as a prisoner of war camp during the Civil War. The exhibits contain lots of guns, but also information about the structures and some of the people who lived there. 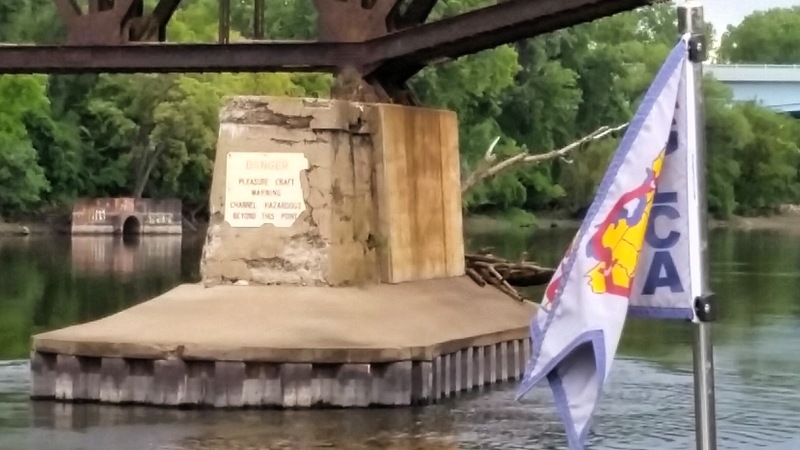 Shortly after we left Moline, we came to Lock 15 which is adjacent to the Rock Island Arsenal. Just as you leave the lock, there is a railroad bridge to go under. The bridge is the fourth one built in this area and was built in 1896. The first one, completed in 1856 was the first rail bridge across the Mississippi river. Shortly after completion, it was hit by a steamboat. The steamboat company sued in court saying that the bridge was a hazard to navigation. There were several hearings on it and the final decision was made in the Supreme Court in favor of the bridge. Abraham Lincoln represented the bridge company in one of the cases that went to a hung jury. The rest of the trip down to Port Charles consisted generally of early mornings, mixed luck at the locks, and long days. The water was still high and we were making good speeds. The lockings were often only a couple of feet or less instead of the ten to fifteen feet that they would normally have been. 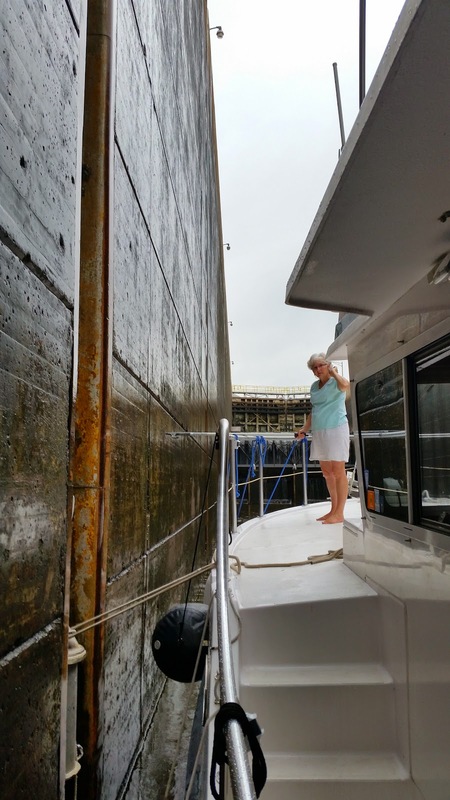 Several times we just floated in the middle of the lock on the way down instead of getting lines from the lock tender. In one lock I noticed a pelican sitting in the lock chamber as we entered. He just floated around until the doors opened, then paddled out to join his friends that were waiting below. I guess maybe they figured that flying down was quicker and he was lazy. 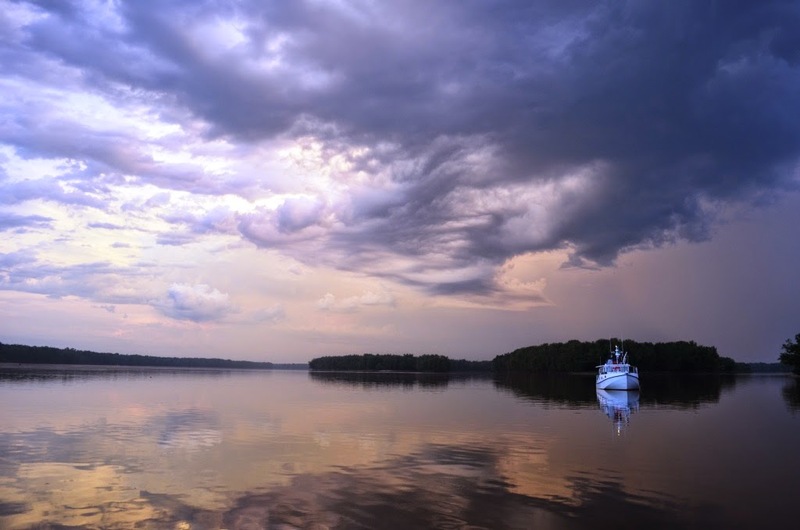 So we made it back to Port Charles Harbor, MO and will take care of some boat chores and re-provisioning before heading farther south and back to the east coast.